“The Original”. 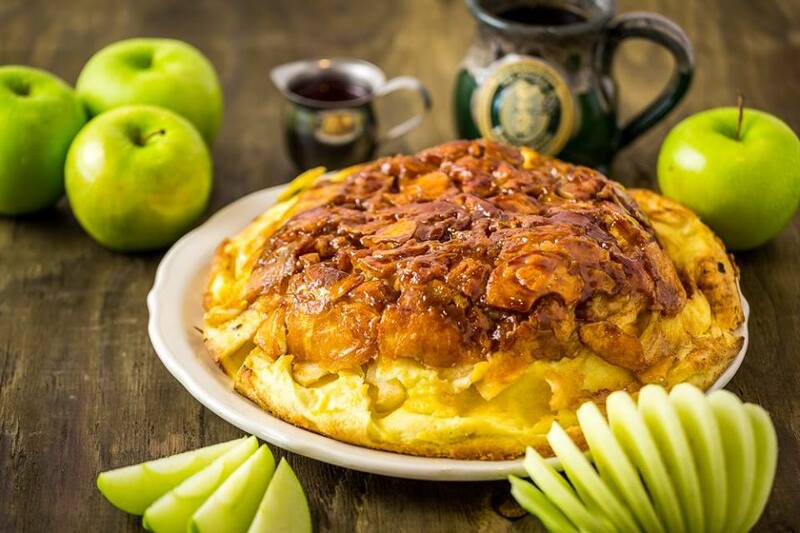 Baked with fresh Granny Smith apples and pure Sinkiang cinnamon glaze. Oven baked, served with whipped butter, lemon, and powdered sugar. 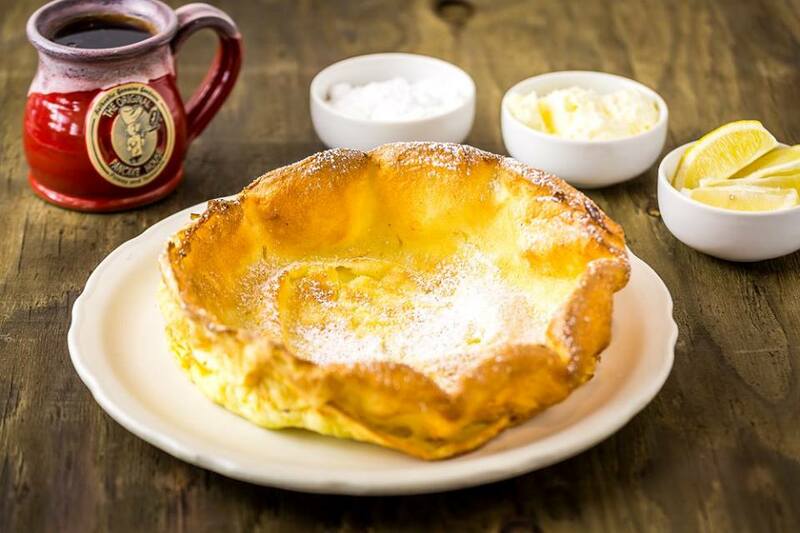 An oven baked smaller version of the German Pancake. An open-faced oven-baked biscuit topped with 2 slices of our famous bacon, two poached eggs, and covered with country-style sausage gravy. Served with three potato pancakes or toast. Two crab cakes topped with grilled tomato slices and two poached eggs. Topped with Hollandaise and served with three potato pancakes or toast. An English muffin topped with bacon, sliced tomato, avocado, and two poached eggs. Topped with hollandaise sauce and fresh cilantro. Served with three potato pancakes or toast. A toasted English muffin topped with sliced tomato, bacon, fresh spinach, and two poached eggs. 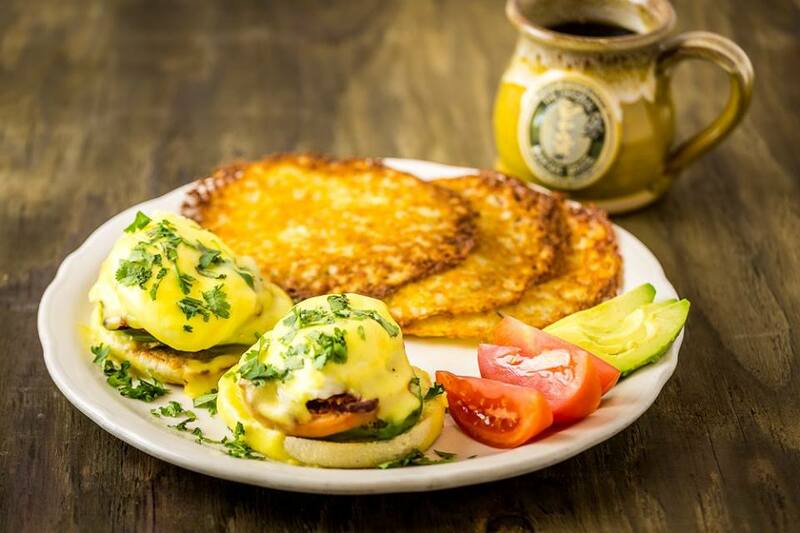 Topped with hollandaise sauce and served with three potato pancakes or toast. A toasted English muffin topped with two slices of Canadian bacon, two poached eggs and hollandaise sauce. Served with three potato pancakes and toast. A toasted English muffin, sausage patties and two poached eggs covered with hollandaise sauce. Served with three potato pancakes or toast. Special recipe sausage ground together with onions, then scrambled together with farm fresh eggs and fresh chopped spinach. Served with three potato pancakes or toast. Two slices of 12-grain whole wheat toast topped with saute’ed onions, mushrooms, tomatoes, spinach, two poached eggs. Topped with our hollandaise. Served with three potato pancakes or toast.